At midnight (on both coasts), HBO debuts the documentary The Strange History of "Don't Ask, Don't Tell." The Bill Clinton-derived homophobic policy ends at midnight. Just released: The Army has sent the official notice that DADT is repealed!! The law is repealed. 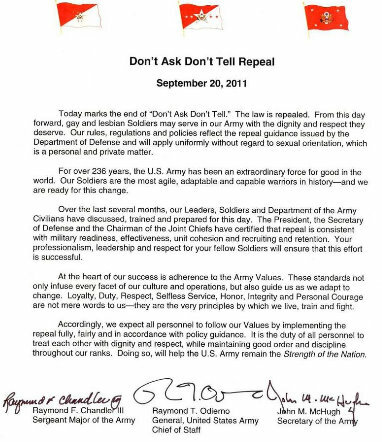 From this day forward, gay and lesbian Soldiers may serve in our Army with the dignity and respect they deserve. Our rules, regulations and politics reflect the repeal guidance issued by the Department of Defense and will apply uniformly without regard to sexual orientation, which is a personal and private matter.